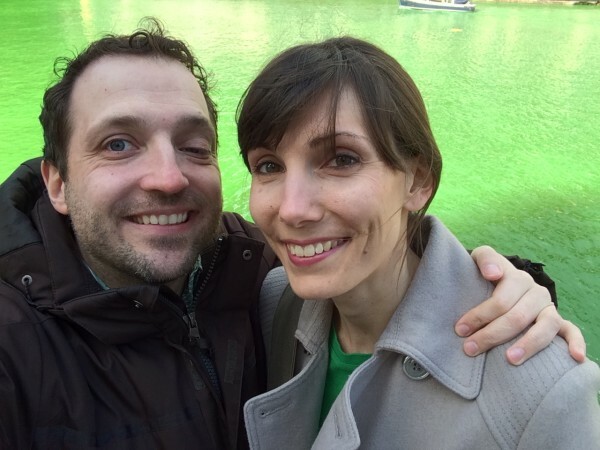 In our semi-annual tradition, Sarah and I headed downtown to see the green Chicago River. Fittingly, we rode the Green Line downtown from Oak Park while wearing green shirts. 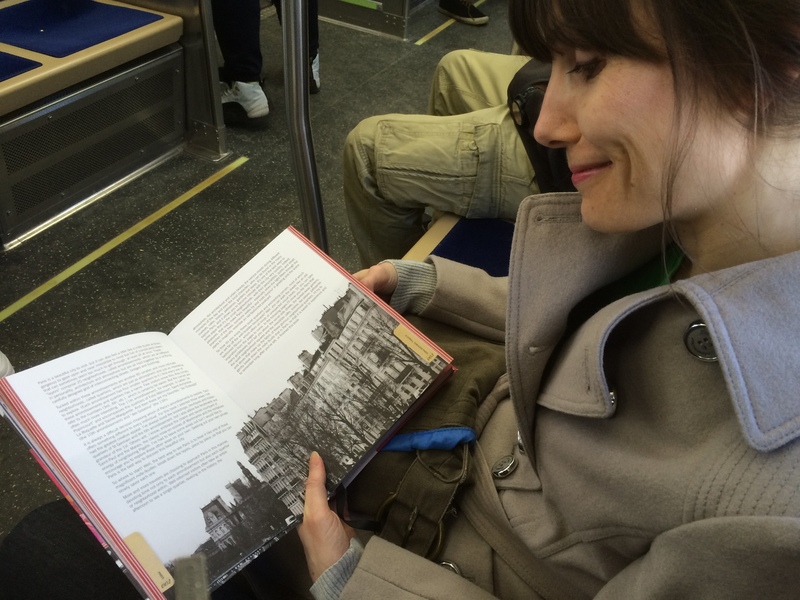 In a break from Irish traditions, Sarah brought her Paris book given to her from Erik and Andrea last Christmas. We both read the book together on the train. The body font is large enough for two to read it at the same time. This book looks very promising as it covers Paris from all the creative hidden angles from a designer/photographer who frequents Paris often. We arrived downtown after the river dyeing and parade. Which is fine, because it's a bit less dense with people. However, enough people were still around for product promotions to be handed out. We got a free cup of soy yogurt, which tasted better than normal, probably because it was free. 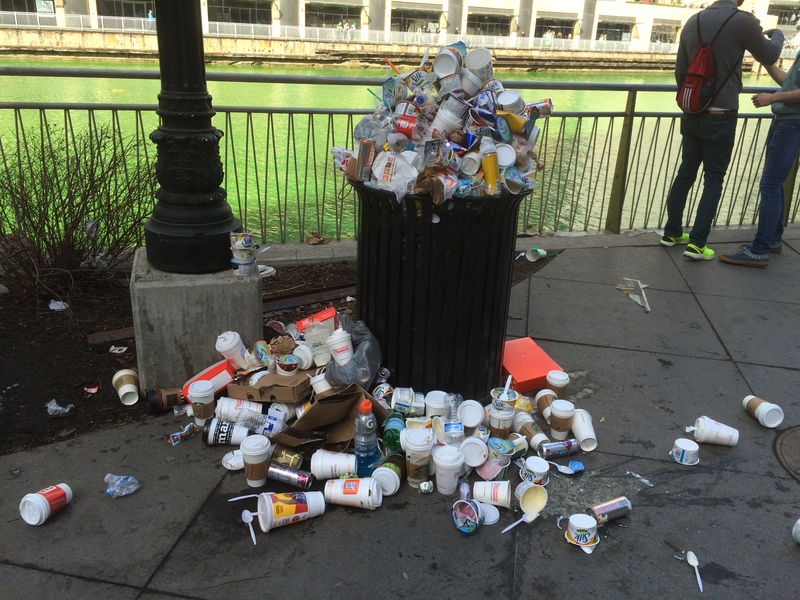 Signs of the crowds' impact could be seen with the garbage stacked as high as skyscrapers. 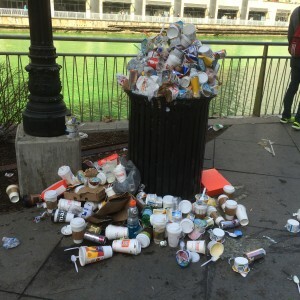 The garbage towers are like crowd-sourced sculptures as each person contributing carefully stacked their free yogurt cups one atop the other. Sarah and I took a couple selfies by the river, part of our annual tradition. Having done this in 2012 and 2013. The last time Sarah and I strolled down the riverwalk is when we had our engagement photo shoot with our wedding photographers Gina & Tony. After grabbing lunch at Which Wich in Chicago's underground pedway, we headed over to check out the School of the Art Institute's 2015 BFA show. The space up on the 7th floor of the Sullivan Center was impressive, as was the artwork. One artist in particular really stood out, Josi Yingjiao Pei. 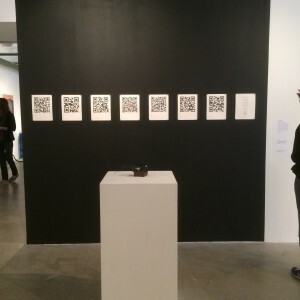 I wrote about her QR code artwork on my spudart.org blog. Please do check out that blog post, her artwork is very powerful. The school's gallery encompasses the entire 7th floor of the Sullivan Center. We highly recommend that you visit this gallery, just for the space alone. It's huge! When Sarah and I visited, it was the opening of the undergraduate show. The floor was covered with students--none wearing green. Too cool to participate in the masses celebrating St. Patrick's day. Or perhaps just more focused on the importance of their show opening instead of drunken people outside. After walking around the entire floor, we walked back outside to the crowds. At this point, it was a couple hours after the parade had finished. All the older adults have gone home, and now college-aged kids ruled the streets. Lots of whooping and yelling. With the Monroe and Wabash train station being closed for teardown the next day, Sarah and I decided to use this station to go home. While Matt waited for Sarah to go through the turnstile, one young fellow who couldn't walk anymore was being carried by his friends. I tried to maneuver myself to get out of this fellow's path, because I didn't want to get hurled upon. But this young man did stumble into me. Thankfully, nothing came out of his mouth. But his friend did have something come out of his mouth, it was apologies for his trashed friend. The whoops and yelling got even more obnoxious when Sarah and I reached the platform. I told Sarah if these drunken kids knew this station was being torn down the next day, they probably start tearing it down now. We were happy when our Green Line train arrived as we were able to escape the madness, and have a nice quiet ride home reading our Paris book.